The TabletKiosk Authorized Reseller Program is designed to provide training, marketing and sales support to resellers that carry the TabletKiosk family of products and accessories. The goal is to provide resellers with the best tools and training materials to increase sales of TabletKiosk products. The newly revamped TabletKiosk Authorized Reseller Program features two distinct benefit levels to fully meet the needs of channel partners' business models. 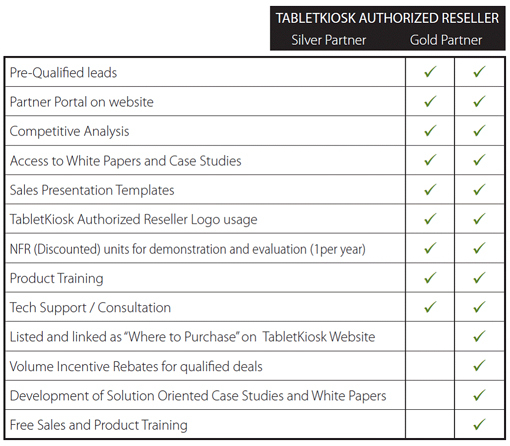 TabletKiosk resellers meeting the program criteria are eligible for many benefits, including pre-qualified leads, sales training, and volume incentives and marketing support. Furthermore, in an effort to grow the exposure in the channel, TabletKiosk strives to assist and mentor new resellers to help them achieve a great understanding of TabletKiosk products, and ultimately increase their business to move up to Gold Partnership level. TabletKiosk has put together this comprehensive package that will be useful to you and help fuel your sales of TabletKiosk products. NewWave Resellers interested in participation in the TabletKiosk Program need only to complete the program application and schedule a web-based product training. NewWave has developed an array of customized VAR Support Programs designed to assist you in driving the profitability of your business. These programs are created to work in conjunction with the vendor programs to maximize your overall return from your partnership with NewWave and it's premier vendor partners. Warranty Advantage Program - Comprehensive product maintenance support programs, services and management tools. 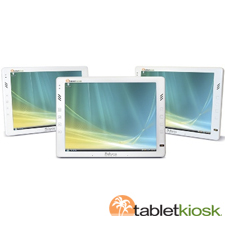 Please be sure to mention NewWave as your Top TabletKiosk Distributor! TabletKiosk Systems will review your application and let you know the status within a few days. Then you can start enjoying all of the TabletKiosk Partner benefits!